Our office emphasizes in high-quality cosmetic, restorative, metal-free dentistry, in addition to our program of preventive dental care and general dentistry. 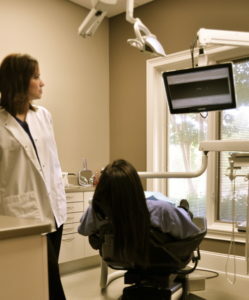 In order to provide our patients with the best possible experience, we utilize the latest dental technologies and techniques to make your treatment as effective and comfortable as possible. In addition, our dental team engages in an extensive program of continuing education coursework to remain at the forefront of modern dental science. Below is a list of the services we provide. Please let us know if you have any questions about our office or the services. We look forward to seeing you! A dental crown (commonly called a “cap”) is needed when a tooth is badly decayed or fractured. In fact, crowns are proactively recommended for weakened teeth as a preventive measure. When a crown is placed on a weakened or fractured tooth, it provides the strength needed to be able to chew effectively without causing further damage to the tooth. The crown fits completely around and on top of the tooth. Veneers are really a wonderful advancement in porcelain dental technologies. The ability to correct cosmetic defects in teeth has never been easier. Patients with imperfect smiles used to go through life embarrassed by their lack of a beautiful smile. However. this has all changed. People suffer from poor oral health due to a number of reasons such as traumatic injury. Years of neglect, or ill-fated heredity. Therefore we understand that smile reconstructions involve as much of an emotional component as it does a physical one. At PSC Dentistry we use the utmost care to calm any anxieties and to have each patient feel comfortable for this process. Bridges. Sometimes called fixed bridges. Morally bridge the gap created by one or more missing teeth. Bridges are a very good solution if you are unable to have an implant. The bridge uses crowns on either side of the gap to anchor the replacement teeth into place. The replacement teeth are called pontics and are made of porcelain. Our state-of-the-art imaging and on-site technology allow us to create your custom crown in a single office visit. No more temporary crowns followed by additional office visits for permanent crowns. Preventative Dentistry involves taking care of your dental hygiene in order to prevent problems in the future. Preventative dentistry usually refers to regular brushing and flossing, but for preventative dentistry to be successful you must follow all of the advice given to you by the dentist or hygienist. Our offices family welcomes young patients, providing a warm, family friendly atmosphere. Our staff makes every effort to ensure that all patients, but especially children visiting for the first time, feel comfortable and are educated about the dental treatment they will be receiving. Our office recommends that parents or caregivers bring a child In for their first dental visit by the age of 3, when most or all primary teeth have erupted. If your hands bled when you washed them, you would be concerned. Yet, many people think it’s normal if their gums bleed when they brush or floss. Periodontal disease (commonly called ‘gum diseases) is a primary cause of tooth loss and is the number one disease in the world. In fact, 86% of the population in the United States exhibits some form of periodontal disease, ranging from mild gingivitis to advanced periodontitis affecting all ages. Many people who want to improve their smile rush to the idea of teeth whitening or veneers, but most have no idea their smile can be improved by simply reshaping their gums. Gum shaping can fix a ‘gummy smile: or one that is uneven or asymmetrical. We use the Biolase soft-tissue laser to minimize bleeding and shorten the healing time. Please ask us if gum reshaping is an option for you. Headaches and TMJ pain can be very debilitating! Too often TMJ headaches are confused with “sinus” headaches due to the fact that the muscles responsible for the TMJ a headache are attached to the temple and above the eyebrow area. Roughly five percent of Americans have obstructive sleep apnea (OSA). In terms of a disorder, sleep apnea is a widespread disorder that really was not taken very seriously physicians until the 1980s. A person with sleep apnea stops breathing. Often for 10 seconds or more, which causes the person to wake from deep sleep. When a tooth is lost, the jawbone where the tooth once quickly began to collapse. In order to keep growing and multiplying, bone cells require the stimulation of biting forces applied to the tooth roots during daily eating. Missing teeth can make eating and speaking difficult and embarrassing and can make you look much older than you are. Dentures and partials offer patients a solution for missing teeth. Having dentures or partials can restore the function and beauty of your smile, giving you back the confidence you need. Our office offers treatment options for patients needing mild to moderate orthodontics to address a range of cosmetic or dental health concerns. For more than 100 years, dentists have used amalgam (silver) fillings to restore teeth affected by decay, disease, and trauma. We follow the IAOMT (International Academy of Oral Medicine & Toxicology) protocol for removing amalgam fillings on request. The term root canal actually refers to the natural cavity at the center of the tooth. Inside the root canal, is soft tissue and the tooth’s nerve. If the tooth becomes damaged. Because of decay or trauma, debris and bacteria can enter the root canal, causing infection and pain. The root canal procedure is a conservative approach taken to save a tooth.